Sly Cooper and the gang returns after an eight year break for their first adventure on the PS3 and Vita to figure out why words are disappearing from the Thievius Raccoonus. With Sucker Punch busy with Infamous: Second Son, the developer of the Sly HD Collection has taken control of the series to show that they have the chops to make a new entry on par with the creators’ prior work. After the events of Sly 3, Sly Cooper and the gang have gone their separate ways as they’ve gotten out of the thieving game with no more villains to fight. Bentley, the current protector of the Thievius Raccoonus, sees the words disappearing from its pages right before his eyes on one fateful day. The gang obviously reunites to use Bentley’s new time machine to go back in time and save Sly’s ancestors to restore balance to their eras. 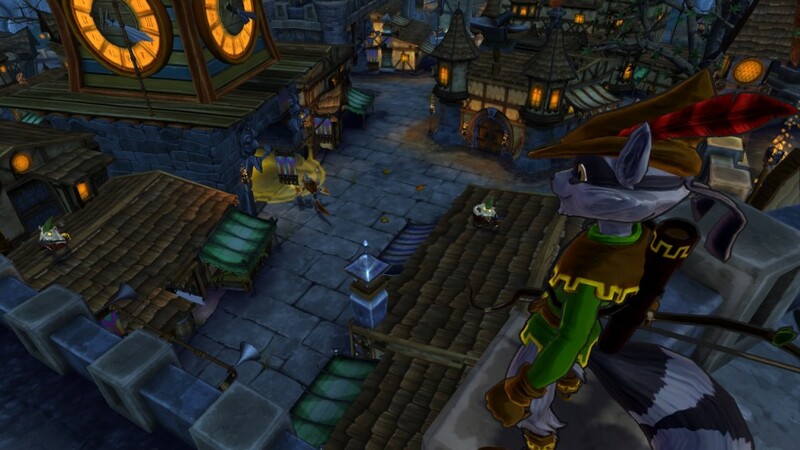 The biggest concern for Sanzaru Games in developing the new Sly Cooper game is that there are a number of avenues with which to take Thieves in Time. Having worked on the HD collection, they’ve seen how the previous three games were handled and have chosen to take the Sly 2 route. That means that you have open world hub levels to explore, clue bottles return as one of two collectibles that you can find, and that Sly Cooper gets the majority of jobs amongst the playable crew in the game. The open world hub levels are bigger here than in previous games, though they are still small enough to let you get across them fairly quickly and there’s a new paraglider that lets you glide around easily as Sly. Despite there being as many as five playable characters in each era, Sly Cooper and his similarly-abled ancestors get at least 75% of the jobs in the game to maintain a tighter focus on its main character. The only major thing borrowed from Sly 3 are the minigames that fill up a large chunk of the time that you’re not controlling Sly Cooper, which were fairly well done time wasters for a change of pace. The major new mechanics are the disguises that Sly picks up in each era, which gives him new abilities when wearing them that are crucial to success in that era along with usually leading to new treasures to collect in other eras. Despite a new developer taking over the series, Sly Cooper: Thieves in Time is an excellent game that clearly shows that Sanzaru Games figured out what made the original trilogy so good. They did a good job of sticking to a format that most resembles the best game in the series, Sly 2, while still adding some new elements to help modernize the gameplay a bit. The mix of stealth and platforming still works incredibly well in today’s market where the 3D mascot platformer has all but died, but it’s the tight controls and well-designed levels that make it a lot of fun to just run around these levels, pickpocket enemies like an expert, and escape from those enemies on the rare occasion that you’re caught in the act. There are a couple of odd control issues in regards to grabbing onto building ledges and some odd issues with some ledges, poles, and such that are too close together, which causes the game to freak out a little on these rare occasions when you’re trying to get around to cause some frustration. I also found one particular mechanic in the last era to be incredibly frustrating due to the poor explanation of how it works before it finally clicked. Thieves in Time looks great as Sly’s first true HD game with everybody’s character models getting a nice visual upgrade with added detail and polish that makes the game look much nicer than its predecessors in the HD collection. There is one major issue with the visuals, which are some big framerate drops in the third and fifth worlds that causes lots of stuttering when you move the camera across the entire city as it noticeably drops frames in the process. It’s not unplayable by any means, but it’s a shame that these beautiful cities are hampered by such an unfortunate issue. I split my time with the game between the PS3 and Vita versions since the PS3 version has Cross Buy support to give you the digital Vita version for free, which works great with the Cross Save support so you can play and continue the game from anywhere. The Vita version controls as well as the PS3 version does and also looks great on the Vita’s OLED screen, though the major knock against that version are that the obscenely long load times. The PS3 version isn’t all that good with load times either, but it’s counterintuitive to the pick-up-and-play nature of the Vita to have a game make you wait so long to get into and out of the open world. The other issue I had with the Vita version is with its AR Treasure feature, which is supposed to let you use the Vita’s camera to show you where collectibles are hidden in the PS3 version. It never worked for me no matter how many times I tried, which is disappointing since I would have loved to use it to clean up the collectibles I missed after beating the game. What Makes It Worth My Time And Money? 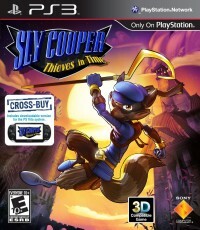 Sly Cooper: Thieves in Time is a great return to form for the series as a new developer took over for Sucker Punch, which makes it a worthy purchase for newcomers and series veterans alike for the $39.99 price tag for the PS3 version. I’d recommend going with the PS3 version for the Cross Buy support alone, though it would be fine to just get the Vita version if you only have a Vita. Despite there being no in-game clock to give me an accurate time played, I believe it took me a bit over 15 hours to get through the campaign without getting all of the bottles and masks. I’d estimate that it’ll at least be over 20 hours for me to get all of the collectibles as I work towards the fairly easy Platinum trophy for both versions of the game.